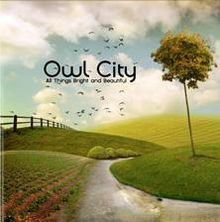 At Relevant, there’s a great interview with muso Adam Young, AKA Owl City about his faith and feel good, pop electronica music. My dentist actually got me onto his great work, and I’m glad I discovered him. His latest album, All Things Bright and Beautiful has just been released and it’s just as good as his first 2 albums, and this one comes with the added bonus of Ronald Reagan, and rapping! I’ve always just asked the Lord that this music be useful more than anything else, and really beyond that my job is just to remain steadfast in my relationship with Him, and just kind of let these songs write themselves more or less, and ultimately never be ashamed of my faith and of my personal relationship with Jesus Christ. So yes, it’s never been my intention to really overthink, “Well, am I going to write up tons of Christian songs, or am I going to try and skirt away from it a lot?” I’ve always just kind of prayed for like, “God, just send me the songs you want me to write, because once they’re written and recorded, I’m going to send them all back to you and point all fingers back up to you.” It’s like, it’s almost none of my business in a funny way. Once these songs are done, I just want the Lord to use them however He chooses. I’ve been meaning to mention this for far too long, but never got around to it. It’d be a shame to never mention it as it does deserve some attention, so here goes. It’s a great audio drama called Spirit Blade that, although is the kind of future set tale in which the government controls everything, still offers something intriguing, with its refreshing spiritual tones and surprisingly, even a few songs. I must admit, I was rather taken aback when I first heard singing, as I wasn’t expecting it at all, but everything about this production is classy and professional. Now, I’ve never been a regular listener of audio dramas, but i did find this quite believable and entertaining. I recently moved house, and before I did I used to listen to this on my hour long train rides each day. Since I’m now closer to work, I don’t listen to anything really as my journey is now made up of two much shorter train rides. That means it’s been a few weeks since I last listened to this, so I’ll let the team behind Spirit Blade explain it. SPIRIT BLADE is a full-cast Audio Drama that uses cinematic sound design, a pulse pounding score, and dynamic acting and musical performances to unleash an action-packed experience for your ears and imagination! Spirit Blade is designed to appeal to fans of science fiction, fantasy and big action films. It is a dark and edgy story with songs and a soundtrack that fans of industrial electronic music will enjoy. The voice acting and sound effects are great and once Merikk has his eyes opened to the world he’s really living in, the pace and scale and intensity of the story ramps up considerably. For a long story, it’s always easy to follow and the creation of the world just by dialogue is convincing. You can find heaps of freebies about this unique production here, such as previews and interviews, to see if it’s your cup of tea. Honestly, this is a great time for Christian produced art, with the likes of church driven Sherwood Pictures getting mainstream attention for films like Fireproof and the upcoming Courageous. Spirt Blade is a 2 and a half hour audio drama and you can buy it in CD ($13) or Mp3 format ($10) right here, as well as other audio dramas, such as the sequel to Spirit Blade, Dark Ritual, which was produced more recently and seems more polished. Trailer for Spirit Blade below. 70 mins. Good and bad horror flicks, Star Wars and our look at characters travelling to new worlds. We look at some of our fave comics in which characters discover new, and surreal, worlds. Nerdcore rapper Adam Warrock has teamed up with indie publisher Oni Press to create some funky new tunes. What a grand idea. Official info and track list below, and if you want more geek centred music, check out the excellent Kirby Krackle. The internet’s foremost comic book nerdcore rapper and the comic industries creator-owned publishing powerhouse unveil twenty tracks inspired by Oni Press creators and their work. 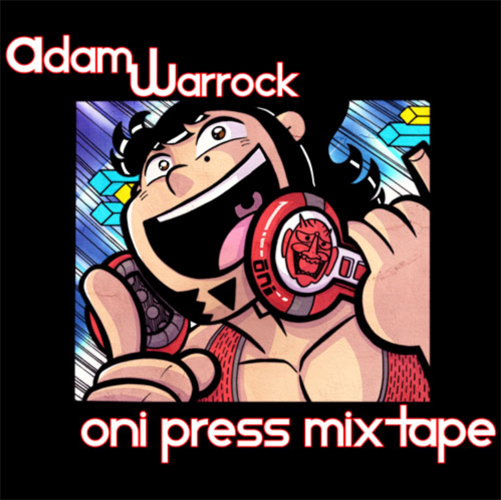 The ONI PRESS MIXTAPE features master lyricist Adam WarRock giving his spin to Oni comics including: Queen & Country, Super Pro KO, Possessions, The Sixth Gun, Hopeless Savages, Wasteland, Salt Water Taffy, Guerillas, The Crogan Adventures, and Stumptown. The album also features interlude tracks with creators Antony Jonston, Cullen Bunn, Brian Hurtt, Greg Rucka, Jarrett Williams, and Jen Van Meter! The best part about it? It’s F. R. E. E. So go grab yourself the ONI PRESS MIXTAPE at his website! 66 mins. We make beautiful music together. We talk about the unique intersection between comics and music and also discuss which of the Friends we resemble, William Shatner singing and True Romance. Comics written by musicians such as Gerard Way from My Chemical Romance, Anthrax’s Scott Ian, Claudio Sanchez from Coheed and Cambria, Ghost Face Killa. Also comics based on Neil Young’s Greendale album, Alice Cooper, Prince, KISS , The Archies and Aerosmith. And for the education of your auditory inputs, here are the songs in order as heard throughout this episode. At the Australian Centre for the Moving Image at Federation Square in Melbourne you can see the new doco about comics writer Grant Morrison. It will be shown on Friday January 28 at 6:45 pm and tickets will be available soon. The trailer is below and here’s the official site for Talking With Gods.